Our trip started on July 3 in Southwest Michigan. That evening about 8 or 9 we took a room at the Continental Motel in White River. David wasted no time before getting in bed and falling asleep. I called my wife and took a shower and went off to sleep myself. About midnight David informed me he didn’t think he would be able to sleep anymore and wanted to know if I thought I could sleep in the car while he drove. I did not want to start out trip tired but I reluctantly agreed and we were back on the road by 1:00 a.m. I slept off and on and then had an early breakfast on the way to Armstrong. Don Elliot (Mattice Lake Outfitters) was surprised to see us in the morning, proclaiming that they were expecting us in the evening. But no worries we could go ahead and get our ride to Magotte Lake. Here is where the brain drain from lack of sleep came in. We not only left some extra maps in the vehicle but I also left my camera! Fortunately, Dave had his camera and through my Inreach I was able to request Mattice Lake Outfitters to put the maps and my camera in the food barrel that would be delivered to Whitewater Lake for pickup halfway through our trip. Our Mattice Lakes Outfitters shuttle to Magotte Lake was driven by Duane Boucher of Boucher brothers bear camp. Duane left the corporate world some 20 years ago to live the life of his choice. 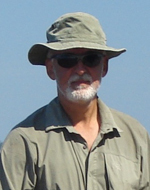 He is very knowledgeable about the Wabakimi area including the people, the lakes, and the fishing and hunting. He seemed to us to be an encyclopedia of bush life in general. The conversation was very interesting. However, in all the talking I failed to ask Duane about details of the take out at his bear camp on the Pikitigushi at the end of our scheduled trip. We reached the put-in at Magotte and soon everything was in the boat and the long-anticipated trip had begun. We ate lunch as we drifted in the canoe with a mild breeze at our back. All was well with the world. The only map we had for Magotte lake was from the Wabakimi project. I badly misjudged the scale of the map and therefore the size of Magotte. By leaving it at that I am skipping over the embarrassing details! It was much bigger than I thought. It is a beautiful lake in its own right especially at the northerly end. Dave first got out at the portage into Kenakskaniss but could not immediately say there really was one. It was in rough enough shape to make carrying the canoe overhead impractical. We just carried it by the handles over, under and around stuff. The mosquitoes and black flies greeted us with great enthusiasm. At the put-in we were rewarded to see a beaver at work. Looking back as we paddled away it seems the land in the middle of the channel was actually an island and that the opposite channel might actually have been runnable. Not sure. Didn’t get a good look at it because there was a significant amount of the insect population still flying around our heads and neither one of us felt like stopping. Kenakskaniss lake was beautiful in the sunshine. As we paddled southeast toward the portage into the 7 sisters falls area the campsites on the south shore of Kenaskaniss looked so inviting I almost suggested we camp on one of them. But the plan was to go to the falls and I kept quiet. As we paddled we could clearly see a moose ahead of us swimming across the lake at a narrower spot. Anybody who has been on the 750 into the falls area knows it is a rocky and bouldery affair. I had hurt my back less than a week before our trip. The areas with the large boulders required us to carry the canoe by the handles. As at the portage out of Magotte that hurt my back quite a bit. Most of the rest of the portage I carried the canoe on my shoulders which did not aggravate the back. We decided to take the campsite that was halfway through the next (the 400 m) portage and right on one of the falls. We had already camped once at the site on the lake before the steep (rope requiring) portage and thought we would camp there again but decided why not enjoy a different one. We stuck to our plan of spending two nights there. We agreed it would be difficult to say either of these wonderful campsites was better than the other. We were thrilled with where we were at. In terms of heart and lungs, I was in shape for this trip. But my muscles were definitely sore from the first days paddling and portaging. It was great to stay put for an extra day and relax, and read, and enjoy the beauty. It was good for my sore muscles and gave me a chance to count and itch the mosquito bites almost all of which I had picked up at the portage out of Magotte Lake. Dave did some fishing at various spots but with little success. I worried about my back. But Dr. Dave (professor of physical therapy) believe it was probably just temporary. He was right. In the next few days, the pain disappeared completely. Woke up truly refreshed and feeling rested for the first time since the basically all night drive. It was a glorious day in paradise! We enjoyed a sunny breakfast by the falls. It took us three hours to get back to Kenakskaniss lake. We again carried by the handles through the boulders. It was Dave’s turn to carry the rest. At first try, we did not get through the quickened current at the top of the rapids. But on our second try, we were able to power through. It had rained a bit while we were on the portage trail. By the time we stopped for lunch at the first campsite on our right it was mostly blue sky. We camped at the most northerly Kenakskaniss lake campsite (west side) marked on our map. I took a spot on the northern edge of the clearing and fairly near to the water. By 6:30 I was in my tent reading, writing and going over the maps. The wind was fairly strong. About the time I was ready to sleep I got to thinking about the incredible amount of fallen trees in back of and on the sides of that camp site. I could see the trees next to my tent swaying back and forth. I also noticed some of them were already fallen and merely being held up brother trees. I finally got out of my comfortable bed and without much effort at all pushed down several trees. I felt I was probably safe at that point but in a moment of overkill decided to move my tent onto the rock more in the middle of my site. Dave was in his tent and had been listening to the noise of my commotion not sure what it was. As I moved my tent near to his he decided the sound must be a bear or something and let out a shrieking yell. I apologized and told him it was me. When he found out was I was doing he laughed his head off for a while. As for me, I ended up getting a pretty good nights sleep even though through the night I kept sliding downward some. We didn’t leave camp until about 10. It took extra time to track up the two swifts at the northern end of Kenakskaniss. Through with those, we soon made into the little pond where the portage into Boulder Lake began. As we looked for it the biggest clue for us was a guy carrying a canoe overhead. This turned out to be a group of four from a camp or YMCA in Minnesota. It rained a bit as we made our way over the portage trail. The trail itself was clear and well worn. Back on the water, we were able to paddle through, not portage around a section of wild rice. We had lunch at the first campsite on Boulder Lake which was a high rock on our right side. After lunch, we paddled up to the next site. The decision was unanimous to head back to the first site. Camped up at the top, we were thrilled with the site especially the view. We were a little behind the estimated schedule. Left at 8:30 a.m. At the bottom of Shawanibis we saw what turned out to be the other half of the camp trippers we saw yesterday. They inquired about where we saw their colleagues. This little group did not seem to be in quite the hurry the first group was in. We paddled all of Shawanibis into a stiff wind and with hard rain. It was cold but we just kept paddling. We took note of the apparently empty Wildwaters Outpost as we paddled by. Hard to say it was really empty though. The weather would have had most sane people inside their cabin. We made it to the railroad track about 1:30. There was a steep hill that led up to the tracks themselves. An old canoe was tied on the hill. Laurence’s Wabakimimaps (which I liked and would definitely order again) just doesn’t seem to have the portage drawn in the right place. We spent significant time looking for it. Eventually, I made my way up to the tracks and walked along it but could not see any portage. In the meantime, we ate lunch. David wanted to run through the culvert since the map note suggested it could be lined in low water. I disagreed. It appeared to me to be a no return affair (or at least no easy return) and I could not get a good look into the culvert. No way was I going to make a blind entrance into it. Finally, we pulled out the Wabakimi.org (Uncle Phil) map and it was immediately clear where the portage was. It is basically straight up the hill and over the tracks. It was covered with a different color or kind of stone or gravel than the rest of the hill. It was a lot easier than it looked. We rested the canoe on the tracks for a moment. David joked that we should leave the canoe there while we went and got the rest of the stuff. Very shortly the train came barreling down on us. Once on the other side, I walked up to the other end of the culvert. There were several stumps lodged right near the end there. It would not have been impossible but not easy either. The rest of the culvert appeared clear. Shortly we began our paddle of Onamakawash Lake. It was getting a little late as we made our way to the first portage. Our map showed two portages near this portage but we could not find either one of them. In addition, it was a buggy area. I remarked to Dave I wouldn’t want to camp here if there was a campsite. We pushed on to the campsite near the next (60 meter) portage. We were relieved to find it very much did exist. The scenery was excellent. In the rapids here Dave found his best fishing spot of the whole trip. He actually started after sundown that night and was at it again early the next morning. I forget how many walleye he caught but I clearly remember he was giddy! With the long day today we were basically in line with the estimated schedule. The morning was overcast but very pretty with the mists rising of the water. We made our way through several portages to the last rapid which dumped into beautiful Spring Lake. At this beautiful spot, we took baths. It was at least partly sunny. Our happiness was running high. What a beautiful spot! As we made our way toward the Great Portage I noticed it was a special area and asked Dave if I could have his camera. No sooner was the camera out than a bear jumped off an island to our left and swam right in front of us all the way to the other side. Powerful looking thing! It took longer than I expected to get to the Great Portage. The beginning was quite muddy. We made our way to the campsite on the portage near our beginning. Here we ate lunch. The sun was shining. The portage is flat and almost totally clear. I had envisioned this to be a rocky area but it was quite the opposite. We knocked it off in two hours including our lunch. Not bad for two 62-year-olds. As we paddled onto Smoothrock Lake we were happily amazed to find it perfectly smooth with no wind. It was late afternoon or early evening. We saw up ahead the fishing camp on the west side. We choose to stay on the east of the large island in the middle of the lake. We would paddle up the east side where we would hopefully eventually camp on a site marked on an island on that side. I noted we would have to stay west of the more immediate island that is basically sitting in front of the opening that leads to the eastern leg of Smoothrock. However, I did not look at the compass. We chatted as we paddled. We couldn’t believe the smooth, windless lake. Soon we were looking east to open water. I thought we were on the east shore. What was this water? We paddled that direction a ways. It was pretty. Finally, I got out the compass and map and realized we were heading for the eastern leg of the lake. Sure enough. We had got on the east side of the island. Back on course, heading north, it didn’t look like there was a way through. In other words, it looked like the island's a peninsula. But our map said differently and it was right. marked campsite. Finally, as were about to clear the large island in the middle of that section of the lake section we noticed its northern end was high, clear and steep rock. We wondered if there might be a campsite there. We wondered if we should spend the time and energy necessary to find out. We paddled a bit in that direction and a look with the binoculars seemed to reveal a human-made rock landmark. A little more paddling and our hearts were gladdened and relieved to see it really was. The perfectly calm water, the high up view and the songs of the resident loons made this one of the best campsites of our entire trip. That night I didn’t have to lift my head to see the water. I tried to drink in and bottle up the songs of the loons. It was precious medicine for the whole being. In the morning wind and water were still perfectly still. We determined to take advantage of it. It looked like we had about 16k to the widening of the lake at the top. About halfway a motorboat zipped by, its occupants never looking at us. We pulled over to an island for a break and to study the map a bit. There was a little wind by now. Now we saw another boat. They were just drifting as they fished. We paddled over for a chat. The boat was occupied by a guide, a father, and a son. They had come from Thunderhook lodge on the east leg. The guide indicated the top of our leg was “just around the corner.” On our island, I had pronounced we were about a two hour paddle away. Unfortunately, my assessment was correct. His probably was also . . . for a motorboat. We reached the top by 12:30. We had lunch and continued for a ways but wind and waves forced us to pull over on the island about 1k south of the entrance to the bay that would take us to our eastward turn toward the Berg River. Here I slept and read. We still had wind and waves but decided to make a go of it at around 6:30. We made it into our bay which was much calmer. We paddled past our eastward turn mainly because it didn’t appear to us to go through. But after a short time and once again a check of the compass and we were sure that was supposed to be our turn. It was into the evening and we took the conservative decision to camp on the right just a bit past the entrance to the Berg. We either loved or were pleased with every campsite on our trip except this one. The views were limited and it was somewhat buggy. It was just a place to sleep. We left camp at 6:30 this morning determined to eat breakfast at a better spot. It was a beautiful early morning paddle on still water. We ate breakfast on an island not far from the entrance to lone breast bay. We entered Lonebreast about 10:00 a.m. Lonebreast was the one place where it seemed the paddle got a little long. It was somewhat windy and it was overcast. But we did see a bald eagle. Then again we saw bald eagles throughout our trip. A couple fishing boats passed us by. We found them eating lunch on the nice island site that sits about half-way up the bay. They were cooking their catch. We ourselves had a lunch about 3:30 at the little campsite at the beginning of a portage on Laurent Lake. In the lower section of McKinely Lake we enjoyed watching a beaver at work. It was early evening and we were tired. We were in for a surprise. Much of the landscape of McKinley lake had been devastated by fire. We thought we could see where the first marked campsite was but nobody will camp there for a long time if ever again. After McKinley, the next campsite marked on our maps was on Best Island! No way were we going to make it there this night. As we came around the corner our eyes saw the beach on the northeast side of the Lake. We headed there. and that is where we set up our tents. There were fresh moose and bear tracks in the sand. Later by binocular, I could see that the second marked campsite was not in the burned area. It looked small but hard to say from where we were. The beach was a nice place for a bath. We were in our tents by 8:30 ready for the night. I was missing my wife this afternoon and evening. Sometimes when I paddle multiple hours in a day I have problems with circulation in my lower arms, hands and fingers. In the morning it takes a while for them to be useful. And it is painful as the circulation comes back. It may be that I sleep hard on top of my arms and the circulation gets cut off that way. I have absolutely no problems any other time. Anyway, this morning, at wake up, I had an immediate call of nature which required toilet paper. It was hard to get my hands to work but I got the job done . . . barely. We didn’t leave camp until about 9:45. Once again I used my look at the map and thinking where the portage must be method instead of using compass and map. This cost us some extra time. It didn’t help that the the “Bear Camp” on our map hasn’t existed since the fire some 5 years ago. After the last portage out of McKinley we were delighted to see a mama and baby moose. We kept paddling their direction. Mama stared at us for a long time and then led her young one out of there. After we rounded a corner we saw the two of them running for a long time. They crossed at a narrow spot we would soon paddle through and then headed into the bush. We had a late lunch on some rocks just before Whitewater lake opened up. All was pleasant. This lunch was the last meal I had with me. We fought along the shore heading southwest for about 30 minutes but the wind and waves and whitecaps finally proved too much and we found a place on the rocks. Best Island was clearly in view. In the other direction we could see the neatly laid out first nation settlement. It looked empty. Finally about seven p.m. we decided to make a break for it. There was enough wind and decent size waves, to keep us paying close attention to what we were doing. We were glad to pull on the beach at the Mattice Lake Outpost. John Paul, the attendant at the lodge came flying out of his cabin and gave us a warm welcome. He had been expecting us at some point. In the wind and waves, which seemed to be increasing, there was no way we could make it across to the proper campsites on the south end of Best Island. It was a chilly night. John Paul even invited us to join him for breakfast in the morning. He promised to fry up some bacon. We sheepishly explained that neither of us ate meat but that we would love the hash browns and other things he mentioned - and we did! We had great conversation to. All we can say about him was what a super nice guy! That night he retrieved for us the 60-liter food barrel that had been flown in for us several days later. Dave and I took the food from it and replenished our separate 30-liter barrels. The 60 litter did not go back empty though. We and especially I lightened up the load quite a bit. Extra rope and clothes went it and other odds and ends went in it. I sent back a couple of books. I even sent back my hatchet which always stays right by my side when I sleep in the wilderness. To this point our trip had included approximately 7500 meters of portages. But we knew we had more than 7000 meters ahead of us. Of course, the 7000 to go like the 7500 we had already done would all require more than one trip. This morning it was sunny and calm. The big lake was smooth and still and beautiful. On the Ogoki, just before the first island, we saw the second bear of our trip. It was a young one and like the first was swimming. We took the 800 some meter portage past the first impressive rapid. Really couldn’t get close enough to see about the feasibility of taking the shorter island portage. Seen from the trail it was definitely not a rapid we wanted to be swept into. Our trail was actually marked by a piece of flagging tape - I believe the 1st we saw on our trip but most of them after this were flagged. The trail itself was fine. It is basically flat and there were only a couple fallen trees obstructing the way. The foliage is definitely growing up on the trail though. We ate lunch at the second rapid on the Ogoki. When we paddled onto WhiteClay Lake we were amazed at the glass-like surface. Of course, the sky was reflected in the water. We were mesmerized by the beauty. We alternated between sheer silence and fervent expressions of thanksgiving for the beauty. The first two campsites marked on our maps on the south shore didn’t seem to be much. We finally came to a large area with a beach below and plenty of exposed rock above. As it turned out there was a rickety picnic table there and some wooden crates. Somewhat scattered around were cooking utensils including quite a large frying pan. None of this is what we wanted to see. But the view of the lake was excellent. There wasn't a lot of flat area in the clearing either. I ended up putting my tent down on the beach area and David put his on rock quite aways on the other side of the main area. According to what we were told Whiteclay Lake was an important lake for the natives back in the day. Apparently, arrowheads and the like can readily be found there. A cold morning. Had to wait for my hands to get working. Whiteclay looking beautiful. The Raymond river is basically separated from the lake by seaweed and I suppose some land but not much. In other words, at that point, it kind of just looks like the bottom or southern end of the lake. You actually enter the narrowing that is the river, going south west. My attitude had been hey just follow the west shore and we can’t miss it. But we did! Frank Worsley I am not. By the time we got on the river we were paddling into a brisk wind. We ate lunch at the end of the portage trail between WhiteClay and Pickett Lakes. I pulled out my notes and confirmed True_North and his brother had also eaten here. The trail bypasses a nice waterfall. Aside from the waterfall, the Raymond is not, in my opinion, spectacular in appearance but we did see several bald eagles. We entered the relatively small Pickett lake and were very soon paddling into a stiff wind and seeing whitecaps. We found the obvious place to set up the tents for the night. We were about 10k and several portages behind the estimated schedule - not bad. After a good breakfast, we left at 8:15 and paddled to the end of Pickett and began making our way on the Raymond River. Soon we came to the roughly 660-meter portage that would lead to a small pond with an approximate 260-meter portage on the south side of it. From this pond, close to the put-in of the 660 portage, the Raymond river can be seen coming from the south-west. Our route went to the south-east. Anyway, I carried the canoe just fine on the 660 until slipping and falling at the very end. It was a gray day with a few sprinkles. The 660 is a pretty good trail. I don’t recall any obstructions. Dave had carried his pack and food barrel together so it fell to me to enjoy the walk back to the beginning o the trail by myself. It was a nice walk even if the skies were gray. I made sure to make plenty of noise to avoid meeting a bear. The map showed another trail crisscrossing our trail. It shows to be starting at the 2nd or middle rapid that our trail avoided and after crossing our trail going directly to the Raymond bypassing the pond our trail ended at. On the east side of our trail, there was some flagging tape but lots of good-sized fallen trees. I never discerned anything resembling a trail continuing on the west side of ours. Dave carried the canoe on the 260. My turn was on the 98. That just left the 140 my notes describe as more an animal than a portage trail. We were now into “Annette Lake.” We took the nice camp on the west (actually more south at that point) shore. It continued to be overcast and it was chilly. We set up our tents right away in case of rain. Then we made lunch and to our joy blue skies eventually showed up. I got in my tent a little early for reading and writing. There was a beaver in front of our camp and in the little cove on the side of our camp. He didn’t seem to care about our presence. He just kept working. As I wrote in this journal at 9 p.m. I heard at least five or six more slaps of his tail. In the morning Dave told me how he watched it all. Just after today’s 260 meter portage into what I am calling North Annette Lake was, except for a slight breeze on Magotte, the first time this whole trip we had any wind at our back. I had told Dave that I had been advised to take this trip in the direction we did to avoid prevailing winds. As our trip continued more than once Dave quipped that the prevailing winds could be defined as the opposite of whatever direction we were going! I hesitate to say this because I wouldn’t want anybody to take my word for it. But I don’t recall seeing any current that would keep a person from doing our route the opposite direction we did. It was a very cold night and morning. Once again it took me about 30 minutes to get my hands working right. It was painful. When I got out of the tent Dave had a fire going. There had been plenty of wood left at our site by previous campers. It was a beautiful morning. The mists were coming heavy off the water. The sun was shining and the water was calm. We ate lunch on the rock marking the beginning of the long portage into Cliff Lake. I was excited. This was the lake that moved me to choose this trip. On this one we took turns on the canoe carry. Back in our boat, we were able to paddle over a little ledge marked “liftover" on our maps. I had recalled true_north’s comment that it probably could be paddled over on the left side. Maybe we had more water because I remember looking at it and thinking “where would we stand to left over that.” When the water began widening out it was clear there was going to be wind. When we came to the real opening into the lake we were face to face with it. We pulled over and got up on the rock. My copy of true_north’s map of cliff lake had gotten wet. But I could make out the campsite he had marked. Once fully around the corner, we could see where we thought it was and it wasn’t far so we made a dash for it. The site is definitely nice. But I was feeling disappointed. I couldn’t really see any of the larger cliffs I had seen pictures of. There were some cliffs to see for sure but not the high ones I had seen pictures of. We definitely planned to spend two nights here so I thought maybe the next day we would have to move our campsite. I didn’t realize the low laying late afternoon sun was actually blinding us to the high cliffs on the other side of the lake. Later that night the cliffs appeared in all their glory. We did not experience any mosquitos while camping on Cliff Lake. Due to wind and waves, we only made one paddle down the lake today. We only made it to the place where it appeared the high-up campsite is and made the decision to turn around. We got back just in time to get ourselves into our tents before a short rain hit. We had a lazy day. I did a lot of reading by the edge of the water on the rock in the kitchen area of the site. It is a great site. In the evening we could have paddled and thought about going across the lake and climbing to the top of the cliff but decided to just relax. We left camp about 7:00 or so. There was no wind and the lake was smooth like ice. Paddling close to the cliffs there was little visual difference between the actual cliffs and the reflection in the water. The next hour and a half were more than I had dreamed of. We were in the right place at the right time. The first pictograph we found was the moose on the east side of the lake. I had in my hand the map I printed out from True_North’s trip report. As stated, it had gotten a little wet but I could still read it. It showed where we could expect to see pictographs. It was especially helpful in pointing out the site on the south-west corner of the lake. So glad we went there! We took a lot of pictures. We cooked and ate breakfast at the put in for the 1st portage on the way to Bad Medicine. We noticed someone had had a little fire there. Later, near the end of the 2nd portage, we found what appeared to be one of those emergency plastic blankets or shelters. Nearby was a plastic paddle in usable condition. Thinking of the three items together we speculated someone may have been having some struggles. The two portages coming out of Cliff lake (to Bad Medicine Lake) were in pretty good shape. Of course, in this area of cliffs one has to expect climbing and descending. And yes it is pretty steep at the Bad Medicine end. But with care, no too bad really. By now I had finished Zoya Phan’s book “Undaunted: A Memoir of Survival in Burma and the West.” Sometimes as I felt weight on my shoulders as I portaged I thought of the terrible flight thousands of Karen people had to make out of their homeland. Whole families. There were babies to carry. Sometimes there were steep gorges where they would cling to trees and bushes as they felt their way along the path, their flip-flops trying to find a grip. There were fleeing from killing and burning and terror. I realized our portages were basically nothing. We had food and water. They largely depended on things they could find in the jungle. I am so glad I know many Karen refugees who now live in Michigan and can help a few of them in a little way. The 300 some meter portage between Bad Medicine and Ratte Lake was not bad at all. We had a late lunch at the rapid coming out of Wash Lake. David fished for about an hour there catching only one (good sized) Northern Pike. No Walleye. Our maps showed a campsite near this spot but we looked pretty good for it and could not find it. We found what we decided was a very nice site on the west side of Derraugh with a great view of the eastbound arm that would lead to our next portage. We were in our tents by 9 or so but of course, it doesn’t really get dark until 11. From my tent, I could look down the now calm arm heading east without lifting my head. It was a great view. Again, during the night it was completely 100% quiet there except when the loons sang. It was equal to the best loon concerts we heard on our trip. In the morning we both agreed it seemed to be in stereo. On our trip, Dave had told about an older lady he had met in his neighborhood. She didn’t have anybody and so in time Dave, and I am sure his wife, begin to look after her. Eventually, she gave him medical power of attorney as well as the ability to handle finances and make arrangements for her. Dave didn’t know how long she was going to live but all the arrangements were made should she die and Dave felt free to go on our trip. This evening my wife messaged me that this lady had died. I decided not to tell Dave until the morning. It was a beautiful morning with the mists rising off the lake. We left camp at 9:30. True_North and his brother had voted the 1400 plus meter portage into Pikitigushi Lake as “the most poorly maintained portage.” The night before I messaged Don Elliot that the timing of our pickup depended on the condition of the portage and with True_North’s description in mind, I told him I didn’t think it would be in very good shape. Paddling over to the portage I told Dave about the death of his elderly charge. He wasn’t surprised but still sad. I didn’t know that later this day I would have to give him worse news than this. As we approached the portage we noticed an easily seen new piece of ribbon tied to a branch. In fact, when we got out we saw the old faded one laying on the ground. I took this as a sign that the portage would be in good shape. It is true there were only a few downed trees across the trail but it was so covered with foliage along the majority of it I wondered how long before the trail itself would be lost. Significant parts of the trail are boggy. At one point there was enough water to “line” the canoe. At 12:30 we were looking at beautiful Pikitigushi lake. I messaged Don Elliot our ETA. We crossed the lake in time to avoid being delayed by the growing wind. The entrance to the river isn’t obvious but it is there. There were no campsites marked our maps but I thought it looked like there was plenty of room to camp on the east shore just before the river begins. We didn’t stop to look carefully. It was never clear to me what expect when we come to our pick up spot. I had pictured us pulling out right the bridge. Not sure I had read the end part of True_North’s report. Don Elliot had messaged me something about it looking like a park. I didn’t try to keep track of where we were on the river. I knew we would see a bridge when we got there. As we paddled along we heard rapids up ahead. Not having seen the bridge I figured it must just be swifts since there were no rapids marked on the map. But I decided to ask Dave to pull over so I could put the camera away. Pulling over on river left actually allowed to see that the rapids were not just swifts. At the same time, we had noticed the lawn on river right. All of a sudden it hit us that was our take out! When we actually walked up on the bridge we saw we would have been lucky to survive if we had been caught up in that rapid. We ate our lunch and right on time Austen Elliot showed up to pick us up. Very nice guy! He told us all about growing up in Armstrong which is to say all about the outdoors especially fishing. When we got back to home base one of the ladies told me I needed to call my wife. Dave was in the shower. When Dave had come to my house at the beginning of the trip I was taken off guard when, as I did last minute things, I heard him tell my wife that his wife Sarah’s leukemia was back. I heard him comment that she told him to go ahead with this trip. She knew how much it meant to him. I was, of course, saddened. I was also humbled that under the circumstances he still wanted to share this trip. I don’t remember discussing it on the long drive up. Once we hit the water I asked him about it. He was realistic but hopeful. We talked about it a few times on the trip but Dave had a great time. He loves the wilderness. When I called my wife she told me Sarah was in the hospital. They thought she had a stroke. The details were not good. It seems she had become quite confused. I was outside arranging our vehicle when Dave came out. He was anxious to get going and wanted me to hurry. Then I told him about the phone call. It took a moment for him to take in what I was saying. I gave him the number of Sarah’s friend. While Dave called I quickly took a shower. We said our goodbyes and pulled up the driveway a bit and pulled over. With his medical background, Dave didn’t believe the stroke thing. He was convinced cancer had gone to her brain. Naturally, he broke down in tears. I put my arm around him trying to comfort him. He made it known he wanted to drive straight through the night. I told him I supported the decision but I knew I was exhausted and told him I did not know how much help I would be. Dave turned about to be right. It was brain cancer. When I talked to him later in August he told me a lot of details. He indicated the ongoing influence of our peaceful time in paradise was a big factor of support for him. In September the two of them took a trip to Quebec together. By November the Melanoma had with treatment decreased in the brain but had spread to her cervical and thoracic spinal cords. JoAnn and I pray for them every day. Sarah called us on the morning of December 10. She said she wanted to tell us personally. The brain cancer is back strong. They can't do anything about it. She is in hospice. I met her and Dave in the 70s before they were anything but just friends with each other. On the phone, she was cheerful and positive. We came out of the bush on day 16 of our trip. We had spent two pre-planned layover days in special places. I had estimated we would come out on the 17th day. We were fortunate to not have wind for most of our paddle of Smoothrock Lake and the same for Whiteclay. We had wind but not that bad on Lonebreast bay. Many of our days were fairly long. My opinion best campsite - night 1 and 2 at the waterfalls, runner-ups- Smoothrock Lake and Cliff Lake. Prettiest Lake- Cliff Lake with Whiteclay Lake in icy-smooth condition and Spring lake as runner-ups. What can I say? It was a wonderful trip. I still think of it often. Last edited by Ipaddle on December 14th, 2017, 11:02 am, edited 3 times in total. Hi Dan! Sounds like a great trip, yet another destination high up on my list. I'm sorry to learn about your paddling partner's bad news. Very hard. You mentioned problems with your hands and arms numbing up. I've been experiencing similar problems for the past couple of years. Double-blading seems to be worse than single-blading for me, and days where my arms are given significant workouts seem to be worst. My arm position during sleep seems to be linked to severe bouts. Something I use which has helped a lot when sleeping (as the problem can cause me to wake up several times during the night) is wearing a small, lightweight metal-reinforced wrist brace that is designed primarily for alleviating the symptoms of carpal tunnel syndrome (which nerve testing by a specialist ruled out). The brace, however, keeps my hand aligned straight out (180 degrees) from my forearm. The numbing tends to occur when my wrist dips south of my forearm for an extended period of time during sleep. If your problems are related to nerve injuries a similar brace might provide you with some relief. Thanks for sharing your report on your Wabakimi trip. Martin, thanks for reading. I will have to look into the wrist brace. ipaddle - sounds like a memorable two-week plus paddle in Wabikimi. You guys were certainly not deprived of wildlife sightings - or good fishing spots! Glad to hear you got to spend some quality time on Cliff Lake. Did you guys scamper up those cliffs across from the campsite? 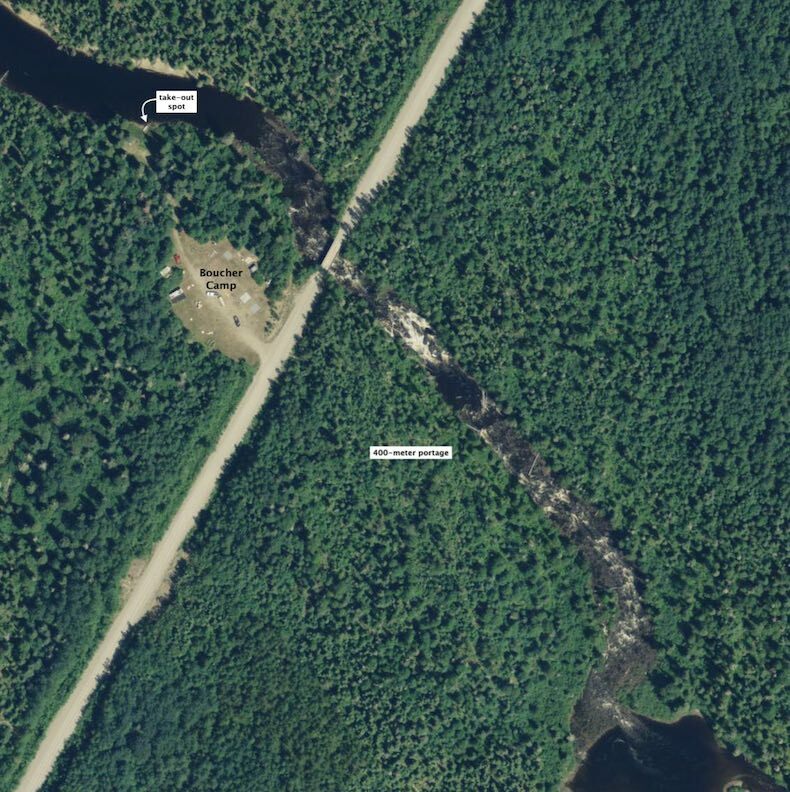 Re: the take out before the bridge - here is a sat image I recently added to my post on the stretch down the Pikitigushi River from Cliff Lake - good that you saw the clearing on river right! Cliff Lake - and the Kopka Falls/Seven Sisters section - is our #1 choice for next year's paddle. Thanks for the updated info on portages and great campsites. So are you thinking of doing the same route we took or something different? Your route sounds great. i was thinking you'd come down the Boiling Sand but your route into Smoothrock worked nicely. I liked your choice of Lonebreast Bay instead of the Berg to cut off a couple of days of paddling. 1. Paddle up the 'gushi to Cliff Lake from the Boucher Camp. 5. take out at Magotte Lake where you put in. We'll definitely spend a couple of nights at both Cliff Lake and in the Seven Sisters area. We'll also check out the certified A+ campsites you mentioned! Thinking about returning to Cliff Lake myself. If I were to do it, I am thinking I would just fly into Whitewater Lake and take a slow solo trip to the Boucher Camp. One option for us would be to fly into Cliff Lake at the start - it is about $750. Or - It would take us a day and a bit to paddle the 28 km. up to Cliff Lake from the Boucher camp area. If you flew into the Mattice lake outpost at Auger Lake you could paddle up the Witchwood River to Whiteclay - a nice rarely paddled stretch...four days or so from Auger Lake down to the mouth of the Raymond - and you know the rest! The plane option certainly simplifies things. We've got all winter to figure things out! Update - put into the report.